Newspaper Rock: "In Defense of Pocahontas"
20 years after the movie’s release, its character and premise still feel notably progressive. But Pocahontas as a character is much more complex than Aleiss allows. She does throw herself on John Smith as he’s about to be executed, emphasizing the value of human life and the destructive nature of war, but her move is reciprocated minutes later, when Smith then positions himself between Pocahontas’s father and the furious head of the English settlers, Governor Ratcliffe, and gets shot in the process. The injured Smith decides to return home, and begs Pocahontas to go with him, but she chooses to stay with her tribe in her homeland. Instead of sacrificing something for love (like Ariel giving up her voice, or Belle her freedom), Pocahontas puts her identity and heritage first. It’s a bold ending, and one that deliberately subverts real history, which saw the real Pocahontas marry a different Englishman, John Rolfe, and travel to London with him, where she was feted as an example of the “civilized savage” before dying at the age of 21 shortly before her husband was due to sail back to Virginia. Powhatan Nation has a page on its website in which it also criticizes Disney for propagating the “Good Indian/Bad Indian” theme and basing a movie on what is largely believed to be a lie told by John Smith to enhance his own mystique. “Euro-Americans must ask themselves why it has been so important to elevate Smith’s fibbing to status as a national myth worthy of being recycled again by Disney,” the page says. “Disney even improves upon it by changing Pocahontas from a little girl into a young woman.” But an animated feature about the relationship between a 10-year-old (as Pocahontas is believed to have been at the time she met John Smith) and an adult male would presumably have horrified audiences. “We had the choice of being historically accurate or socially responsible,” Glen Keane said.So other than being historically inaccurate, it was a great movie? Okay! A Native Response to Sophie Gilbert's Article "In Defense of Pocahontas"Gilbert is doing the same thing Disney did. She is promoting this dishonest and self-serving myth at the expense of the Powhatan Nation and all the people who are led astray by the narrative of that film. By focusing on "female agency" and an "environmentalist message," Gilbert is throwing millions of people under the bus.Reese linked to the Powhatan Nation's statement on the movie but didn't go into it. Her point, if I read it correctly, is that a Native viewpoint should be central to any critique of Pocahontas. You wouldn't critique Birth of a Nation without noting its racism against blacks. This is the same kind of thing. Sophie Gilbert found the film progressive and feminist. Readers feel it whitewashes a horrific past. Perhaps it’s both. By Chris BodennerI’ve struggled with Disney’s Pocahontas as a source of pain and stereotype. Both Pocahontas and Sacagawea are often held up as heroines in the Western perspective, their stories reduced to kinder details rather than serving the interest of the dominant culture. Yes, there is visibility in telling their stories, but it is a tainted visibility, a false reality rendered through the dominant culture, which seeks to ameliorate, always, the horrific methods by which they came to occupy an entire nation’s worth of landmass. Nobody wants to feel like a settler. Disney’s Pocahontas gives just enough of a flogging to the “real” bad guys to leave the non-native viewers coming away feeling as though they’ve done the good work of recognizing their own faults, while the pain of forced assimilation and erasure continues for the Powhatan Nation and others. It is the Western lens that sees a progressive narrative in the way the settlers of Disney’s movie are mocked (but eventually befriended), the way Pocahontas rejects a voyage overseas (but was in reality kidnapped—and in the sequel, even this part of the story is made family-friendly and song-worthy), and the way she chooses family over love (when in reality her “choice” was anything but). Disney goes so far as to try to turn the narrative around by having the Powhatans call the settlers the “savages,” but it’s only done half-way. Much like coverage of mascot issues often features white voices in the interest of “fair and balanced coverage,” the movie ends with the two groups considered even, with no indication of the devastation yet to come. Representations of PocahontasGertrude Custalow, a Powhatan Indian, remarks, “The real Pocahontas was a child, not a voluptuous woman. And one thing’s for sure—she didn’t own an uplift bra (quoted in Tillotson C8)” (Edwards 154). This stresses the sexualized nature of representations of Pocahontas not only in art but also in children’s movies. 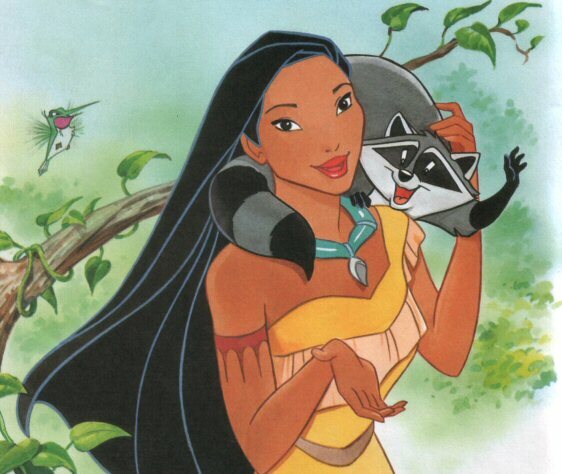 This also addresses Disney’s indifference to what Pocahontas actually looked like. Instead, they make her into a “brown-skinned Barbie Doll” (154). The artist who created Disney’s Pocahontas concerned himself less with recreating what Pocahontas must have looked like in reality and more with creating a generic racial other. He literally combines women of various non-white races to generate a very sexualized representation of Pocahontas. Edwards states, “Pocahontas becomes an historically-impossible multiethnic body—an anachronistic image composed of ‘aesthetically-pleasing’ body parts drawn from American Indian, African American, Asian American, and Caucasian models. Disney animator Glen Keane describes his Pocahontas drawing as ‘an ethnic blend whose convexly curved face is African, whose dark, slanted eyes are Asian and whose body proportions are Caucasian’ (qtd. In Tillotson C8). In addition to historical representations of Pocahontas herself, the visual models of various ethnicities that Keane used for his drawing included Irene Bedard, the American Indian actor who provides Pocahontas’s voice, American Indian consult to the film Shirley ‘Little Dove’ Custalow McGowan, Filipino model Dyna Taylor, black supermodel Naomi Campbell, and white supermodels Kate Moss and Christy Turlington” (151-152).Okay, Disney animator Glen Keane. Thanks for letting us know how fake your version of Pocahontas was! I liked Pocahontas, but I knew her real story. I took the movie as a fantasy largely divorced from reality. Like The Hobbit but with characters who vaguely resembled historical figures. In fact, I suggested that Disney should've changed the characters' names to show audiences this wasn't history. Make the characters generic Anglos and Indians, or even generic fantasy figures--e.g., dwarves and elves. Of course, that would've ruined Disney's marketing plans, so no way was it going to happen. But it was the kind of solution I would've liked. As for the question of how progressive Pocahontas was, I'd say it moved the dial from near zero, in Disney's older movies, to maybe 25. That's only 1/4 of the way to a goal of 100. So you could say the glass was one-quarter full or three-quarters empty. But ignoring the three quarters for the one quarter isn't exactly responsible writing. It's like saying the Titanic's initial voyage was great except for the iceberg. For more on the subject, see Pocahontas Bastardizes Real People.